Our design approach to the Parachute Team Headquarters building interprets the architecture of the parachute as well as the historical context of Ft. Bragg. The technology that allows a 150+ lb. soldier to safely deplane several thousand feet above the earth is expressed and reinterpreted in the light steel frame that supports the arched roof over the Public Affairs and Recruiting Support Center. This theme continues inside as expressed in the arch of the brick parapet wall, creating an interior 'sky' for the display of the Golden Knights’ awards and memorabilia. 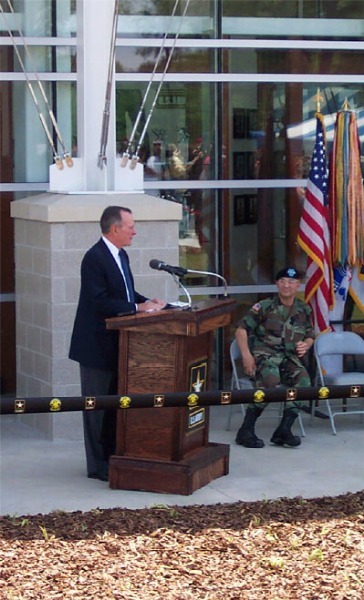 The project was completed two months ahead of schedule, in April 2004, and inaugurated by former President George Bush.